Liverpool have signed Charlton's highly rated teenage midfielder Jonjo Shelvey for an initial fee of £1.7m. The 18-year-old has passed a medical and will officially join the Reds on 10 May, although he cannot play for Charlton for the rest of the season. The England Under-17 international has made 48 appearances for the Addicks since making his debut at 16. "We are trying to bring in British players with passion," said Liverpool manager Rafa Benitez. "Players who you can feel what playing for Liverpool means to them. Shelvey is one of these and we have two or three names ready so we will try to do the best for the club. "I was trying to sign Gareth Barry before and Glen Johnson was the same idea - we have this long-term plan in place and we will try to follow the plan." 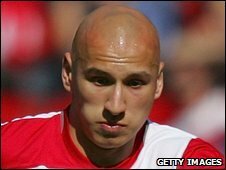 Shelvey has made 27 appearances this season as Charlton push for promotion, although he has recently found himself manly restricted to a role coming off the bench. A product of the academy at The Valley, he had been linked with several Premier League clubs since becoming the youngest ever first-team player to turn out for the south Londoners at the age of 16 years and 59 days. The Romford-born player signed a two-and-a-half year deal with Charlton on his 17th birthday in 2009, with Addicks boss Phil Parkinson commenting: "He's an excellent prospect - I haven't seen a better 17-year-old in the country." Charlton also revealed that they are in talks with Liverpool over plans for a "strategic partnership" for the development of players from both clubs. The Addicks, who are believed to have substantial debts, are fifth in the League One table and guaranteed a place in the end-of-season play-offs, with an automatic promotion place looking increasingly out of reach. But they will have to strive for promotion to the Championship without the services of Shelvey. "It's with the greatest reluctance that we have accepted an offer for Jonjo from Liverpool," said Charlton plc chairman Richard Murray. "No club likes to lose such a talented prospect, but the overall package is one we couldn't refuse, and one which was very attractive to Jonjo. "As a club, we have never stood in the way of any of our young players moving to 'bigger' clubs, and this also applies to Jonjo. "Liverpool are going to develop him over the next few years to be a top player, and I can't think of a better place for him to go."